When you are a guest at the Historic Eureka Inn, your satisfaction is our goal! 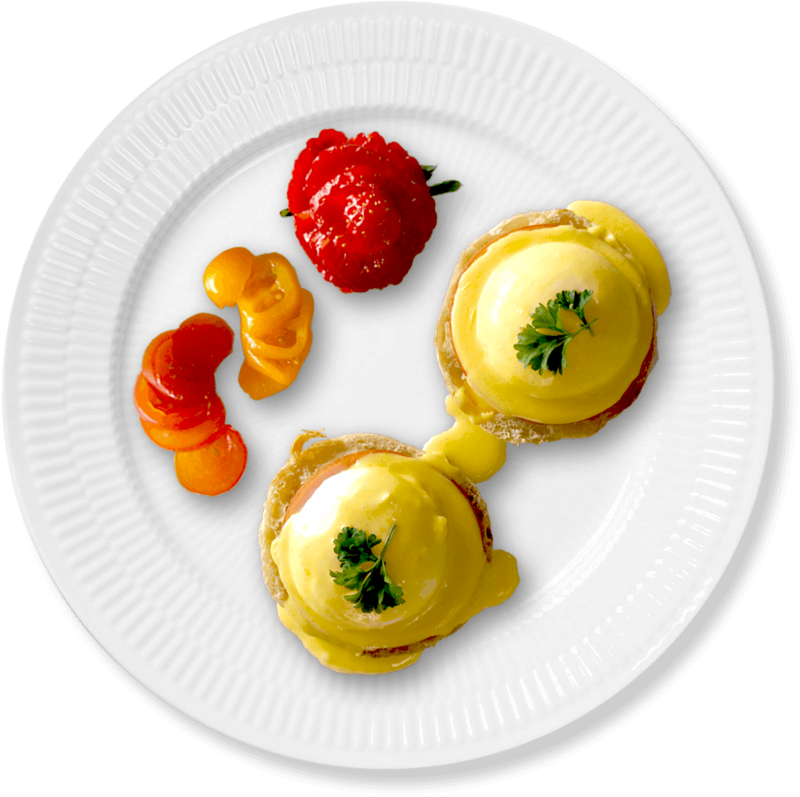 We offer anything from Eggs Benedict to Biscuits and Gravy, we are also mindful of special dietary restrictions. Every single day we strive to bring the best local flavors directly to your breakfast table. Support local, Eat freshBook Today! Enjoy the charm & beauty of a 19th century structure without sacrificing modern conveniences. In January of 2018 Blake and Katelyn rolled out their Brunch restaurant, EUREKA BITES. On Fridays, Saturdays, and Sundays they open their doors and their kitchen not only to their overnight guests but also to the public. “Breakfast for All” stems from their dedication to accommodating guests with certain dietary restrictions. Are you Gluten-Free? Eureka Bites serves GF Almond Flour biscuits and the gravy is Gluten-Free! Their menu boasts breakfast classics like pancakes filled with blueberries or pecans, fried rosemary potatoes, and eggs made to order. If you’re in a lunch mood they also offer several lunch selections including BLTs, Curry Chicken Salad, and their signature fried green tomato sandwich the Whistlestop! All lunch items are served with a zesty pasta salad or fruit and a pickle. Follow @eurekabites on Instagram and Facebook to keep up to date with their Specials and more information. Blake and Katelyn are Jonesborough Residents and they certainly know how to make your vacation memorable! Whether you are looking for a scenic hike and waterfalls, a quaint little shopping excursion, or a delectable bite to eat; they can point you in the right direction. If you're into planning your own adventure, you can always stop by the Jonesborough Visitor’s Center and Museum and blaze your own trail! The Chester Inn museum is definitely something you don’t want to miss while you're passing through Jonesborough. The Heritage Alliance also offers Walking Tours of our beautiful town, you can take in the sites and get the 411 from the people who know it best! Special Events are a huge part of what makes our town so enjoyable! Don’t miss out on a fantastic opportunity whether it’s an open air concert on Friday night for Music on The Square, Jonesborough Days during July 4th weekend or Christmas in Olde Towne Jonesborough which is on every Saturday in December leading into Christmas, our town knows how to have a good time! In the spring of 1797 Robert Mitchell and his wife Harriett purchased Lot #19 from the town of Jonesborough. This two story dwelling was built on a stone foundation, logs were used for floor joists, and the dwelling was of mortise and tenon frame. The interior surfaces were wide plank walls, floors, and ceilings. Four fireplaces provided heat and the exterior was covered with clapboard and the roof was shake shingles. Fast forward 200 years, in the spring of 1997 the hotel was purchased by a small group of residents in Jonesborough. These investors wanted to see this beautiful old hotel restored back to its days of glory. A great deal of time and expense went into the planning process. The challenge was to preserve the charm of the hotel while blending in the amenities expected by the discerning traveler. Three years and almost three million dollars later, the Eureka reopened under the original name, offering the best of the past and the present. All guestrooms are decorated with a combination of period antiques and elegant reproductions. Upon arrival we give you your very own set of keys to the Inn and to your room, so that you can make yourself at home. The inn is monitored by a Smart Home security system, so you can rest easy. Our Premium Rooms are larger than a Standard or Standard Plus room. They have a larger bathroom and include one queen-size bed, two queens, or two twins. They also include luxurious down pillows and a refrigerator. These are the Peddler’s Pad, Peter Miller’s Room, Cook’s Room, Mitchell Room (handicapped accessible, two twins), and Angeline’s Room (two full sized beds). Standard Plus Rooms include one queen size bed and a private bathroom with either a tub/shower combination or a walk-in shower. These are the Russell Room, Garden View, Maxwell Room, and Tub Room. Our Standard Rooms have one full size bed and a private bathroom with either a tub/shower combination or a walk-in shower. These are the Sample Room, Laura’s Room, and Cottage Room.